Jackie Venson live at Rockwood Music Hall, Stage 3. 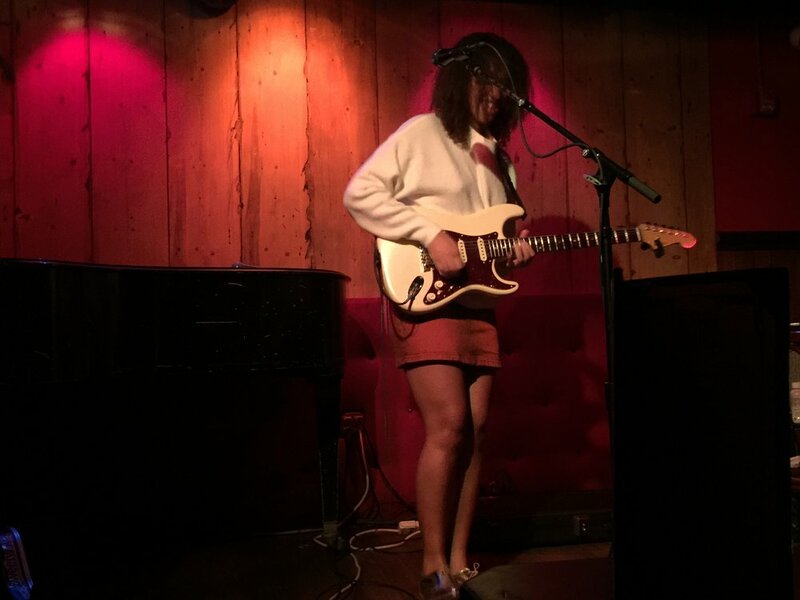 Austin-based guitarist and singer-songwriter, Jackie Venson, ripped the stage at Rockwood Music Hall last week with an explosive performance that blew us away with electrifying amps, growling rifts and sensual vocals. Rockwood’s serene and tranquilly intimate Stage 3 was the perfect feeding ground for harvesting Venson’s powerful guitar solo that savored our appetite with a mix of blues, soul and rock ‘n’ roll. The warm candle-lit venue brought us closer to each other, as we sipped on our brews and cocktails while Venson rock out on her 45-minute set. Performing usually with a full set band, Jackie came up to New York as a solo act, giving us New Yorkers a mouthful of that Texas southern soul that blended beautifully with bluesy rock elements and a distinctive sound of pop. Jackie Venson on guitar at Rockwood Music Hall, Stage 3. 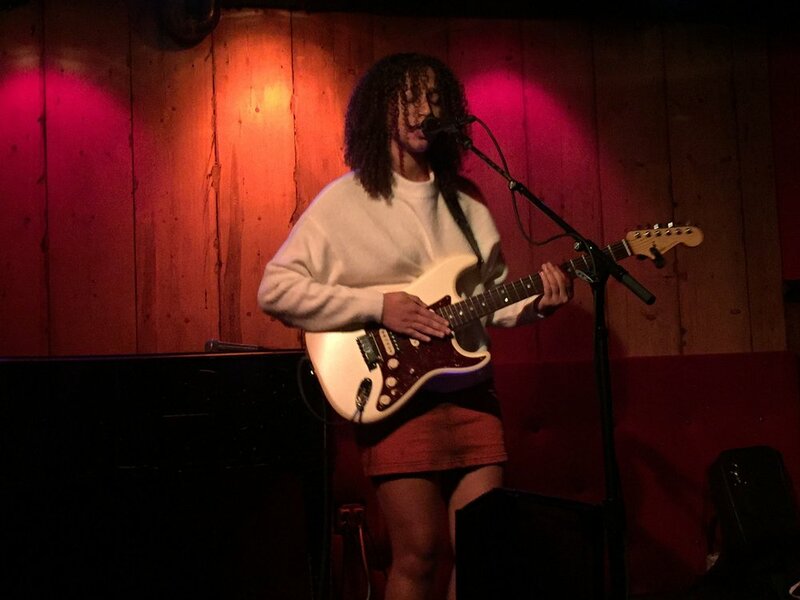 Exposed to music since eight years old, Jackie Venson is a young musician/guitarist that has captivated the hearts and minds of her audiences through her music. Coming off an impressive summer tour with guitarist/singer-songwriter, Gary Clark, Jr., Jackie has become a household name in the independent blues and rock scene. Her mastery of blending the genres blues, soul and rock together speaks to her profound musicianship that’s coupled with her lyrical depth and gripping storytelling. With local shows and tours performed across Austin, TX, Jackie has toured extensively throughout the south and the west coast, enthralling audiences that capture the Jackie Venson experience through the raw power and vibrant soul of her guitar. As a powerful and passionate artist, Jackie Venson illustrated these traits last week with an invigorating performance that elicited those gritty bayou blues and southern rock ‘n’ roll. Jackie Venson on vocals at Rockwood Music Hall, Stage 3. Jackie’s new EP Transcends released earlier this month and was on hand for that weekend as she performed several hit songs from the record. Her solo acts to “Flying,” “Fight” and “Transcends” exemplified Jackie’s versatile compositions and her complexity as an artist to span across genres. On “Flying,” Jackie gave us a flawless mix of pop and rock elements that provided enhanced lyrical ability and stellar musicianship. Her impressive command on stage held audiences in their seats, as Jackie’s guitar rifts fueled a smooth, yet dominating sound. Her play on “Fight” and “Transcends” spoke to Jackie’s ruthlessness on the guitar, while also assembling those 80’s pop kicks and savvy guitar licks that conquered the grasps of the rock ‘n’ roll and blues genre. Her opening song, “Don’t Lie to Me,” as well as her incredible cover to Tab Benoit’s, “Nice and Warm,” were essential memories from Jackie’s NYC visit. On her opener, Jackie displayed a fantastic guitar solo that wowed audiences and provided an alluring sound that drew audiences thirsty for more. On the Tab Benoit cover, Jackie informed us of how Benoit’s song was one of the artists’ many influences for picking up the guitar. Jackie’s act breathed a fresh air of classic bayou blues and American rock ‘n’ roll that took stage 3 by storm, delivering a simmering guitar play, decadent licks and Orleans style amps. Jackie Venson mesmerizing audiences at Rockwood Music Hall. Jackie Venson is a guitarist that has mastered the raw and gritty southern blues with each note her fingers find on the neck and body of her guitar. Her mesmerizing voice, delicate, yet cool attitude and shear talent on the strings are but of the few components that allow her musical expression to be so powerful. Her dominance on the guitar, musical depth and command of her audience has placed Jackie as one of the top emerging guitarists in the independent scene. Her innate ability to blend the genres produces a rich sound of passion and emotion that establishes a connection with her audiences, as well as illustrates the complexities with her musicianship. She has certainly become a driving force for indie-guitarists today and has our recommendation for anyone’s playlist. Follow, stream and listen to Jackie Venson's music today!